Anchorage Hotel refurbishments include new room décor, room lighting, lobby upgrades and more. The Homewood Suites hotel in Anchorage, Alaska has just finished a complete renovation of all hotel rooms and public areas reflecting their ongoing dedication to providing the Anchorage business and leisure traveler with a better hotel experience. Each of the Anchorage hotel rooms includes new carpeting, new beds, new curtains and a tastefully done accent wall. Also included in each room is new lighting and refinished surfaces. The hotel’s general public area improvements include new carpeting throughout the hotel, new lobby furniture, new dining furniture, renovated fitness facility and a host of other upgrades to ensure the continued comfort of our Anchorage, Alaska guests. We welcome all members of the Anchorage community to come take a tour of our updated hotel rooms and facilities. 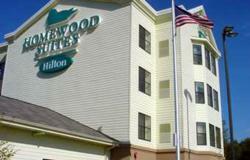 The Homewood Suites by Hilton Anchorage hotel is an all-suite hotel located mid-town just minutes from the Ted Stevens Anchorage International Airport. This completely remodeled hotel offers a free hot breakfast buffet, free dinner with beer or wine Monday thru Thursday, a free airport shuttle and free internet access throughout the hotel. Other amenities include free parking and an indoor pool and workout facility. Come enjoy all the benefits that Homewood Suites Anchorage has to offer you today.